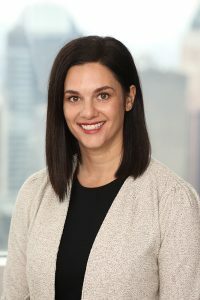 Ashley is an Associate in the Military Pathways Development Program, a corporate rotational program designed to leverage veterans’ leadership skills and attributes while developing them into future senior executives at JPMorgan Chase & Co. Prior to joining JPMorgan, Ashley served as an Army Officer for ten years. She served as a Chemical Corps Company Commander and Military Intelligence Officer in Korea prior to assessing into the Special Operations community as a Civil Affairs Officer. After serving six years in Special Operations with deployments to Afghanistan and across the Middle East and Europe, she transitioned into the Army Reserves. Ashley currently serves as a Major, supporting Special Operations Command - Europe with a focus on information operations and strategic deterrence in the Baltics. Ashley is committed to supporting the veteran community and currently serves as the Director of Operations for Promote, a non-profit that fosters inclusion and innovation in the military's Special Operations community and national security organizations through leadership development training. In its second year, Promote has expanded its innovation and inclusivity training to reach across sectors and government silos. Its workshops are tailored to organizations ranging from small military units to a flag level headquarters, U.S. Military Academy’s faculty and the Council on Foreign Relations Term Member Program. She also volunteers as a project manager for Waves for Water, a global clean water initiative that gives veterans an opportunity to serve their global community in a new way following transition from active duty military service. Ashley is a graduate of the University of Portland where she received her B.A. in Political Science and Spanish Literature. Ashley's work on the topic of information sharing in inter-agency environments was published by Special Warfare Magazine and NATO's Centre of Excellence for Defence Against Terrorism. She spoke as a panelist at the National Geospatial and Intelligence Agency's Levant Conference (2015) and the NATO Terrorism Expert's Conference (2017) in Ankara, Turkey. She is an active member of the Defense Entrepreneurs Forum, Office of Strategic Services Society, Women in International Security, and Global Special Operations Forces Foundation. In her spare time she is an avid foodie, international wayfarer, advanced scuba diver and devoted aunt to seven nieces and nephews.